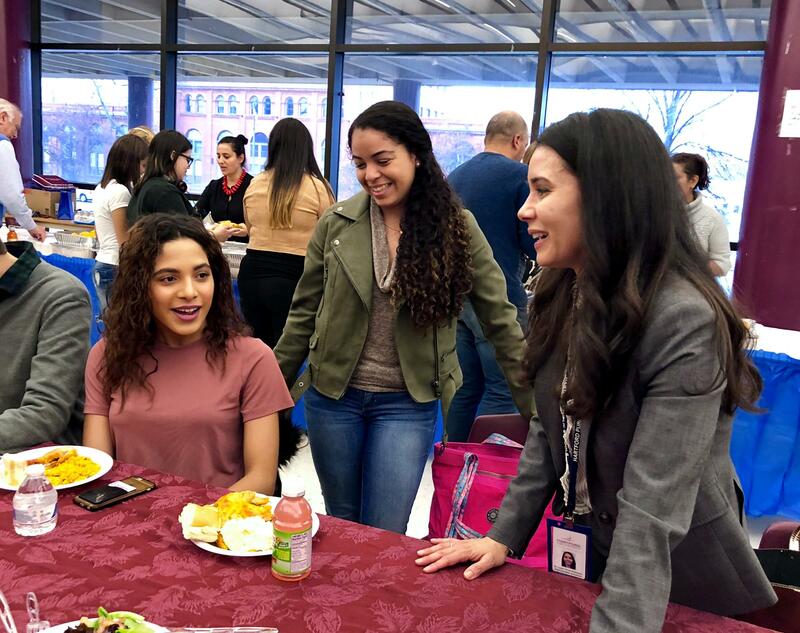 Bulkeley High School senior Yeicy Alejandro, smiling at left, talks to her new mentors from Central Connecticut State University. They're in the new "Ambassadors" program - Puerto Rican evacuees helping other students displaced by Hurricane Maria. Hartford Superintendent Leslie Torres-Rodriguez, left, poses for a photo with Zulma Toro, the president of Central Connecticut State University, during a reception in the Bulkeley High School cafeteria. But who knows? Acosta said. The younger students might also teach her a few things. After Hurricane Maria last fall, at least 70 evacuees enrolled at Bulkeley in the city’s South End, including juniors and seniors on the verge of graduating high school. Meanwhile, a couple of towns over, Central Connecticut State in New Britain welcomed about 30 students from the University of Puerto Rico whose college careers were in limbo after the catastrophic storm. Those college students have since settled into their New England campus and have been tapped for a new partnership that the Hartford school system and Central Connecticut State are calling the Ambassadors program — evacuees mentoring evacuees. CCSU students Marivelisse Acosta, left, and Joandra Vazquez chat with Hartford Superintendent Leslie Torres-Rodriguez, at right. Acosta and Vazquez are evacuees from Puerto Rico who will mentor displaced students at Bulkeley High School. 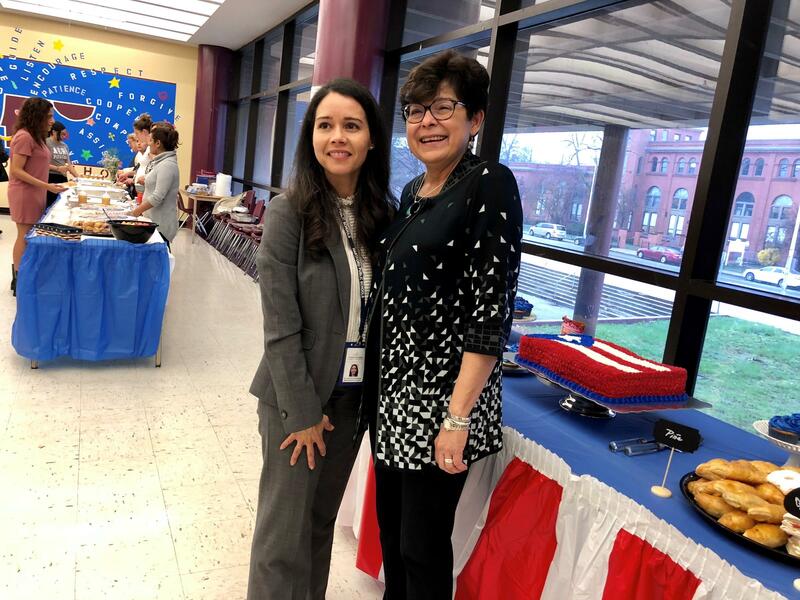 The inaugural reception happened on a rainy evening this week in the Bulkeley cafeteria, where staffers laid out a full spread of Puerto Rican food and even a cake that looked like the island’s flag. 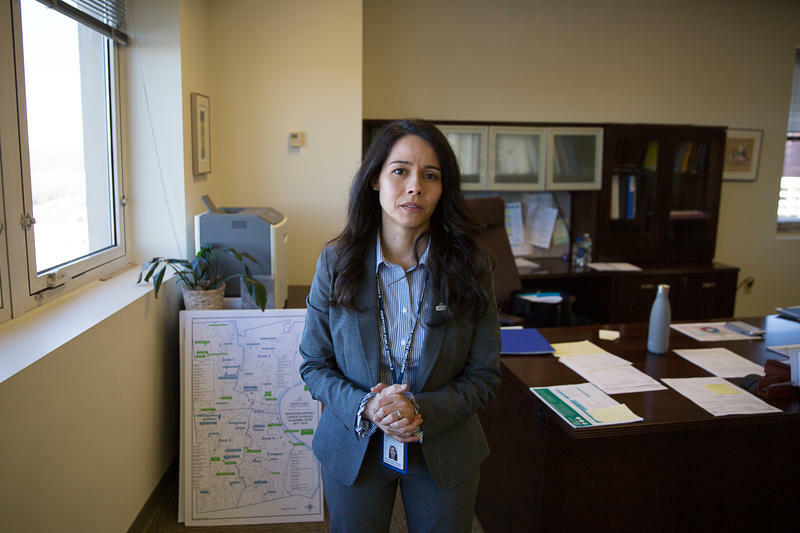 Hartford Superintendent Leslie Torres-Rodriguez said they wanted to introduce a pathway to college for the new juniors and seniors at Bulkeley who survived Maria. Among the guests was CCSU President Zulma Toro, who came with an entourage of top university officials that included the admissions director. 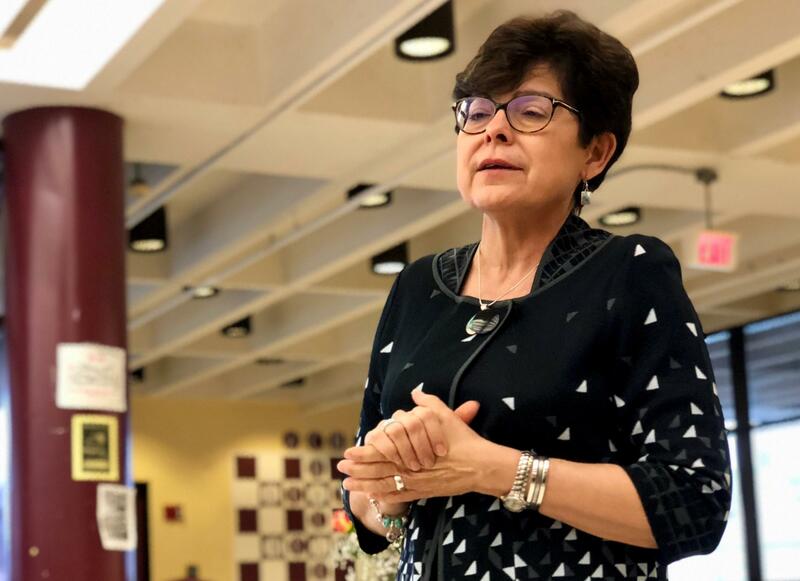 Addressing the younger evacuees and their parents in Spanish, Toro told them that she, too, is Puerto Rican and made a pitch for them to consider her university. It would be like another family to them, she said. Zulma Toro, president of Central Connecticut State University. University officials said they have raised money to fund the program, including stipends for the mentors. 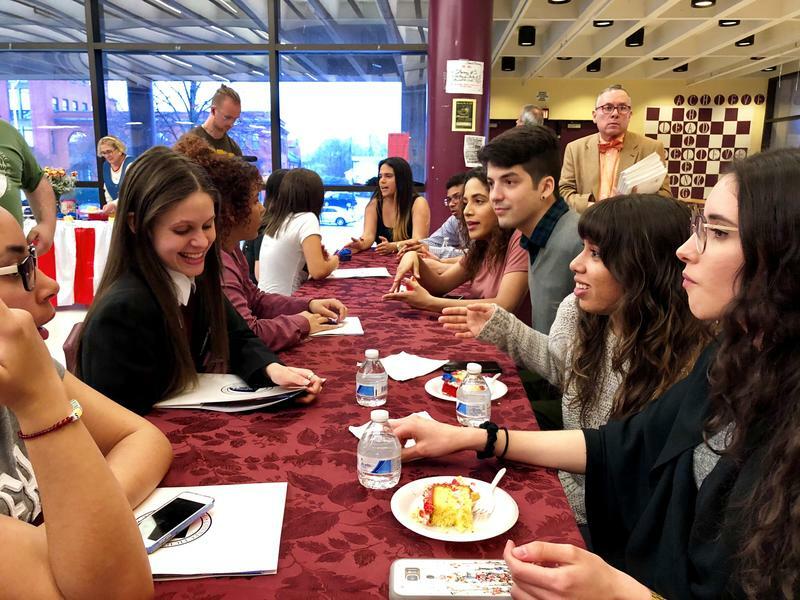 For their first meet-and-greet, they sat with the high school students at a long cafeteria table and gave them insider info on classes, dining plans, and life in the residential dorms. Afterward, Bulkeley senior Yeicy Alejandro said she wants to stay in the area and maybe attend Central Connecticut State. She came from Puerto Rico in November. Like the other mentors, 22-year-old Valeria Arana said she plans to visit the high school about twice a week. And there’s talk of possibly hosting the Bulkeley students during a college-prep program on the university campus this summer. Officials from Hartford Public Schools and Central Connecticut State said the Ambassadors program is just the beginning, and that they plan to develop a deeper partnership to bring more Hartford students to college.